After many years of scoring the county's school Year 6 and Year 8 reading tests in-house, the Education Department of Somerset County Council has out-sourced the work to Southampton-based data-entry specialist, Kendata Peripherals. Council staff are now looking forward to the prospect of having their time freed up to focus on other tasks. Since the late 1970s, most schools in Somerset have been using the highly regarded Edinburgh Reading Test (ERT) series, published by Hodder & Stoughton. These tests provide a diagnostic profile of each pupil's strengths and weaknesses, as well as a reading age and standardised score. After a year or two of scoring the tests manually, Somerset County Council sought to ease the burden on teachers and automate the process by using an optical mark reader (OMR), in conjunction with the council's mainframe computer. 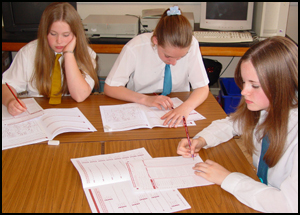 As well as speeding up the test scoring procedure, the OMR meant that the council could utilise separate test answer sheets, thereby enabling the question booklets to be reused year after year and reducing costs. That arrangement continued until 2000, when the council's mainframe came to the end of its life and the education department was consequently forced to take a fresh look at the test scoring process. The department concluded that the best option available for the future would be to contract the work to an external organisation. During subsequent discussions with Hodder & Stoughton, Somerset was put in touch with Kendata Peripherals, who had been providing the publishing company with data-entry services for a number of years. Kendata was already working with Hodder & Stoughton on developing a scannable version of Edinburgh Reading Test 4 (ERT4), for which Kendata had designed and printed new answer sheets to ensure compatibility with a scanner-based forms-processing system. Charles Knight, test publisher of Hodder & Stoughton's Educational Division, commented: As part of the process of restandardising ERT4, we sent out test papers to schools across the country and then piloted the whole scanner scoring system with Kendata. They captured the data and fed it straight back to us, and it all worked very smoothly. Following the successful trial, Somerset decided to continue to use the new scannable ERT4 tests, with Kendata providing a bureau service for the design, print and scoring of the forms. In both 2001 and 2002, Kendata printed some 7000 of the ERT4 answer sheets for Somerset, which the council then distributed to the county's schools. Teachers administered the tests in the schools and returned the answer sheets to the council, just as they had been doing each year since the early 1980s. The answer sheets were then batched up and forwarded to Kendata for scoring, with the results subsequently returned to Somerset for processing and analysis. The ERT4 test is designed for secondary school pupils, aged 11:7 to 16+, but Somerset also needed a scannable version of ERT3, which is aimed at pupils aged 10 to 12. This was developed especially for Somerset, and approximately 7000 ERT3 answer sheets were also processed by Kendata in 2002. We remain committed to removing any unnecessary burdens from teachers, so some sort of central, automated scoring system is essential," said Graham Smith, assistant group manager of the council's Education ICT Group. "The arrangement with Kendata should remove a significant burden from council staff, and as we have a huge amount of work coming in from Key Stage tests, the time saved on scoring the Edinburgh Reading Tests will be very important to us in the coming months. The design of the answer sheets continues to be refined by Kendata, taking advantage of the flexibility offered by forms processing technology. In particular, the efficiency of the whole process was improved in 2002 by pre-printing pupil names and other data at the top of the answer sheets, rather than relying on the pupils themselves to write in the information accurately. One possible future development that is being looked at is the electronic archiving of all the ERT answer sheets by Kendata so that, in the event of a query about a test score, any pupil's answer sheet can be quickly called up and a PDF immediately e-mailed back to Somerset Education Department for verification. Building on this successful partnership, Hodder & Stoughton is working with Kendata in offering the automated scoring service, for ERT3 and ERT4, to all Local Education Authorities and Education Action Zones from September 2002.